Inspired by world-class athletes, Oakley's Flak Jacket XLJ Sunglasses offer the latest technology along with a rimless design for enhanced viewing. Whether you're active, spectating or simply looking for a fashionable look, you need a pair of sunglasses you can rely on for protection of your sensitive eyes. That's why Oakley include pure Plutonite® lens material to filter out 100% of all UVA / UVB / UVC and harmful blue light up to 400nm. It's not just your eyes that need protection as the glasses themselves come with a frame design that meets ANSI Z87.1 standards for impact protection while added durability comes courtesy of the stress-resistant O Matter® frame material. When it comes to the comfort and fit of the sunglasses then two sizes of nose pads are included and the stem sleeves are made of Unobtainium® material to increase grip with perspiration. 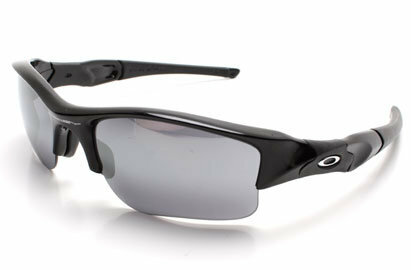 Oakley's signature Three-Point Fit also hold the lenses in precise optical alignment for superior clarity. Presented with a smooth black look to the frame, a matching shade is given to the iridium coating of the lenses to help reduce glare reduction. When not in use, your Oakley sunglasses are well looked after with a soft but protective vault case and Microclear™ bag for lens cleaning.